Dave Brubeck: The 40th Anniversary Tour of The U.K. Deliberate. In listening to Dave Brubeck for the past 20 years, I would define his performance as deliberate. Brubeck’s playing is always well thought out and delivered. This current disc makes no break from this summation. 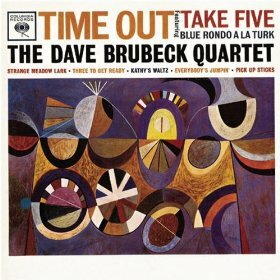 Mr. Brubeck swings with a effortless ease that barely betrays Brubeck’s careful craftsmanship. The 40th Anniversary Tour of The U.K. is very much a Dave Brubeck disc and is in keeping with his most recent Teldec releases. The Nonet?. Ted Gioia in his book West Coast Jazz spends many pages describing the importance of Brubeck’s octet recordings originally released on Fantasy (F-3-239, 1946/OJCCD-101-2, 1991). These recordings predated Miles’ Nonet recordings by three years, but it is apparent that they were both heading in the same direction. Brubeck’s music here is very deliberate. It swings, but in a stilted, planned sort of way. The years since then have softened Brubeck’s approach and thereby providing music of great grace but not possessing the white-hot creativity of his early recordings. The disc standouts are the opener, “Someday My Prince Will Come” and “Deep Purple”. These songs perfectly describe the late Brubeck: confident, deliberate, swinging. Both contain exception musicianship on the entire quartet’s part emphasizing in particular Brubeck and alto saxophonist Bobby Militello. Militello’s tone is ice dry and his phrasing is linear and sensible. But then again, Brubeck would have had it no other way. The band quietly swings through standards, providing a pleasant and thoroughly enjoyable set. Dave Brubeck CD/LP/Track Review C. Michael Bailey Milestone Records United States The 40th Anniversary Tour Of The U.K.